The global economy is weak, and the refusal of Greece to deal with IMF has put the financial world into a shaky position. With nations no longer trusting the Western-established institutions, with many believing that they only exist to serve the bankers and CEOs, people are looking for an alternative. Could a rising BRICS bloc be that alternative? As it has formed several new financial ventures, set for help in development, is it going to become a competitor to the IMF or World Bank? To talk about that we have invited a very special guest: the President of South Africa, Jacob Zuma, is on Sophie&Co today. Sophie Shevardnadze: President Zuma, it is so great to have you as our guest one more time, welcome to our show. Jacob Zuma:Thank you very much, happy to be here. SS: So, Russia has said that BRICS expansion in coming year or two is actually inevitable. What new state or states are ready to join? JZ: For now I can’t say there are specific states that want to join, but all that I know is that there’s a great interest from a number of states. They look at BRICS as a grouping that really carries the future, to some degree; but we have not discussed whether we increase the membership or what we do. But, clearly, if we look at things, it is clear that BRICS carries quite a sizeable future for many countries. SS: Do you have, maybe, a guess of who these countries could be? JZ: No, I can’t guess – I think, that will be going too far. But, I would imagine, it should be countries that believe in the development approach, countries that believe in peace, it should be countries that are looking at how do we lift what is generally referred to as “Third world’, how do we have the kind of relations that are “win-win” relations with bigger countries – I think it will be progressive kind of countries that who’d be saying “we want to change the quality of lives of our people, we want development”. I think, in a sense, the countries that will be keen to join will come from such countries which think in that way. SS: Russia’s Vladimir Putin has proposed, actually, regular consultations of BRICS’ foreign ministers – enhancing, thus, cooperation in the UN; do you feel like the member countries have been acting, maybe, more cohesively – not only in economic terms, but in political sphere as well? SS: Yes, I think so. There are consultations of the officials and ministers. I agree, given the importance of BRICS, we might need more of such consultations at ministerial level. Because, the BRICS…they are doers: once they say “this is what we do” and they do it. Therefore, I agree with President Putin that BRICS needs more consultations, more things to do together as countries, because that, in itself, will certainly indicate to other countries, who are not necessarily in BRICS, that in BRICS there’s happiness, there’s working together, there’s harmony. I think that’s what we need to see. SS: I’m sure you’ve thought about this more than one time. For instance, what can Russia or Brazil give to South Africa – or what can South Africa give to China and India? JZ: We are very clear: firstly, we are able to discuss global issues, we are able to discuss things that affect us as countries. Our discussions are very frank and fair, and there’s a great respect among the members. These countries need to work together economically, in other words, whatever economic activities take place between BRICS members, they need to grow. SS: Right now, when you look at BRICS, it’s operating sort of like a loose group of countries, kind of like the G7. Do you think that countries should integrate more closely and thus become an organization? Should they? JZ: I don’t think we could at this point in time. Say, this is what we are going to be doing. We have not sat down to, say “we now plan how this is going to go”. I think it has also been important to allow it to flow on its own, because it is a voluntary kind of organization, and if we see the benefits – I think we are going to be in a position to say: “Shouldn’t we tighten our relations even more?” Right now, they are very good, the relations – we are able to consult, we are able to work together, we are able to have our summits. We’ve never disagreed on issues, we understand world together; so far, it is much good, even better than organizations that have very tight structures which at times disagree on a number of things. So, it’s a question of this voluntarism, how is it understood by the countries. I think we all understand it equally, that it brings in advantages to us, not just as countries, but for economics in action. The inter-trade within BRICS - ever since it began, it has been growing and it is going to grow much bigger. So, I think, the manner in which we handle things, will determine at a certain point when we want to tighten the kind of structure as an organization or whatever, or we might allow it to go for a long time. It will depend on us because we are not necessarily competing with one another, we are not rushing anything, we are just creating an atmosphere where countries must feel that they are really equals, so to speak, we’re not literally going to be equal in terms of size, population, whatever – but they treat one another as equal, they discuss things with a very good understanding of each other… so, that’s how we approach things. SS: Then there’s, of course, skepticism from the Western side, and also, criticism, which is based on, they say, political differences and internal problems of each member of BRICS – and they are stating these aspects – political differences and internal problems – as a ground of why BRICS will eventually fall apart. I get a sense that West and international community isn’t quite taking BRICS very seriously. What do you think, or why? JZ: No, I think they are taking BRICS very seriously. They might have views about BRICS, perhaps understandably so. Akin to what BRICS has done: you have a bank that is developed, different from traditional banks, which we have experience of; we have big banks that are supposed to help those who are struggling, but there isn’t much evidence of that. The BRICS’ Development Bank says whenever people in the 3rd world, whenever they need to do something and they need funds, they are going to be provided, they are going to achieve their objectives without being put under more difficult conditions. That is an important point that makes people to look at BRICS differently. The very fact that BRICS has a bank, very big, done by very strong countries, is establishing its regional offices in Africa, All other big economies have never done so. It means something about how Africa must be helped, so to speak. That, in itself, indicates something. I think, it could worry some people. SS: That was actually going to be my second question. Do you feel like the establishment of the new Development bank sort of causes concern within the existing institutions like the IMF or the World Bank – or, more importantly, are they ready to treat this new institution as an equal partner? JZ: Nobody has come to us, very clearly, to say: “Look, don’t think we’d love you to be there”. I think, everybody said “fine”, even with some of long faces, “okay, fine” - but – the Bank is there. The question is how to do business? I don’t think people will say “we’re decrying business with BRICS”, because we are dealing with the bank that is among them. One of the countries which is there is world’s second biggest economy. How could they say “we don’t want to trade” with such a country? I don’t think that could happen. I’m sure, BRICS will have the funds to help and to do business. I don’t think people will feel against doing business with BRICS. Of course, jealousy is all there. I’m sure, even companies can be jealous with another company – it’s a natural thing. SS: But also, it’s a question of funding, right? You’ve said “I’m sure BRICS will have the funds for this bank” – but the financial reserves of the backers of the IMF and World Bank are still infinitely more than what BRICS countries can put together as resources. How do you ensure that this new venture stays competitive? JZ: The very fact that it is investing in countries that are economically growing – it means, it is going to be in a position to have a lot of dividends that are going to grow the Bank. I think, if for example, I sit here and say: “Is South Africa doing anything with other banks?”– we are very cautious with how we handle that, because of the fact the experience in Africa is that the more you got help, the more you got into trouble. So, we are looking and this bank that it should operate differently from that, it must really be helpful. Once that happens, people are going to be ready to do business with BRICS’ bank and that will make the bank to grow. I’m sure, BRICS’s bank is going to be a force to be reckoned within economy. SS: So, this new BRICS’ bank isn’t obviously the only headline grabber – there’s also this new Chinese-led Asia Infrastructure and Investment Bank that’s being put together. So do these new instructions I am talking about – the BRICS’ bank and Chinese-led Asia Infrastructure – do they mean a break-up of the internationally-established monetary and development fund system? JZ: No. I think we should also know what has been the challenge. We’ve had these old banks that have been established many years back. The world has moved, the world has developed. We have been for a number of years calling for the transformation of financial institutions, globally. We’ve also been talking about an important development of representativity in these kind of banks. In this kind of institutions you need to be part of these institutions so that you are a part of the process of decision-making, of participating in the alliance, what do they do to everybody else… Now, they have closed the doors. SS: But do you even need to be represented more largely at this point, now that you have these two ventures? JZ: Oh, yeah, absolutely. Absolutely. We are dealing with the world. These ones are the world institutions that must help many other people. Now, if for example, I’m sure if they were not so resistant to that, maybe BRICS bank would have taken some years to come. Because their reaction to reality doesn’t tally with what is happening, so…yes, the BRICS bank is there, but we’re not necessarily saying “we are now establishing an exclusive that one, that you cannot participate in” – we are not saying so. But we now have bank that is an alternative. What I think should happen is that these banks must change the way they do things. I don’t there’s going to be a problem. If they don’t, for example, if countries go to them to ask for help, but they put countries into more trouble – countries will go to the BRICS bank. That’s why I am saying that the possibility of the BRICS’ bank to grow is very vast. People must change their attitude. It goes also the question of how do we do business with the Old World. Because some of these countries were former colonies, they look at us as former subjects. They don’t look at us as equals. Now, if we’re dealing with them in terms of BRICS, we are not looking at one another as former subjects, etc. We look as partners. We might not be of the same strength – but there’s that kind of respect and understanding. I think the Old World has to change its attitude towards what is happening today. They must realize world has changed. That’s why, for example, we’ve been calling for the transformation of the organizations that were established at the end of the last World War. Because if they don’t realize that things have changed, they are going to be left behind. There may be more banks in the line of BRICS. SS: Mr. President, you have actually said that African countries have gotten into trouble by relying on IMF and the World Bank… You know, I’ve read many articles and reports and they’re actually decrying Western infrastructure for helping and giving aid to African countries, and also a lot of African economies are saying that this sort of aid to Africa fosters cultural dependency and also slows down African growth. Why is that? Do you see problems with Western aid to African countries at this point? JZ: We’ve had difficulties, even with the help that we get. It comes with so many strings attached. They don’t give you and say: “Fine, do what will help you.” – They want to dictate as well what is it that you should do and this is a problem. You can’t utilize that kind of assistance the way you want. So, in a sense, it has conditions that will keep you dependent all of the time. That’s what we’re trying to take ourselves out of, and we believe that an alternative bank – like BRICS – does provide an opportunity for us to have a bank that can you deal with at a level in which you satisfied with, so we’re not looked down upon, and people were saying: “Yes, let us do business”. We are not saying: “Look, after all, you are a former subject, you know. We’ll tell you how to do business” – we don’t want that. SS: So, do you think the African countries do not need to borrow themselves into bankruptcy anymore, like it happened in the year 2000, when the African debt was so high that it had to be written off from the Western countries – they can now come to BRICS? 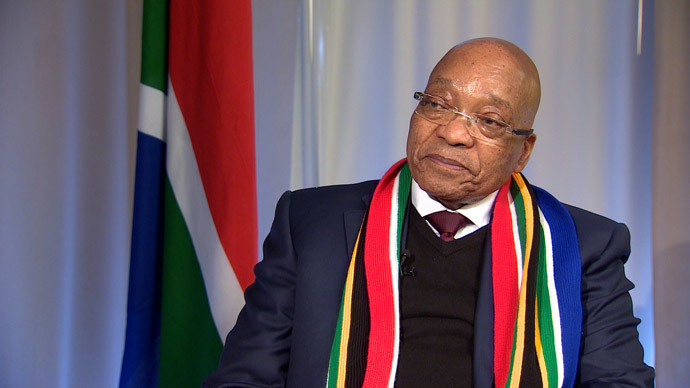 JZ: I am not making a call to say: “Don’t do business with the West” – not at all. We’re doing business with the West, we have been doing business with the West. I am saying now, that there’s an alternative, you can make a choice. If you want to go with all this kind of understanding – it’s your choice. I am not going to say: “Don’t go”. But if we are here, we do business. South Africa is still doing business with the Western countries, and we’re not saying that we’re going to call it off, but we are now saying that there’s an alternative. If you want to do business, you want to develop with less kind of commissions – we have now a bank, in which we are a member. We can now do more, but it doesn’t mean that we’re cutting off others. But, certainly, we’re going to go where there’s more advantage and more possibilities rather than where there’s less of that. JZ: No one has said: “Now that you are free, you have diamonds and gold, we have got gold, we have got coal - let us come together and discuss how to do with business so that it benefits the people here” – it still continues, it still goes that way. Nobody says “you’ve got people who are unemployed, let us create factories here, and let us have joint ventures to create factories that will beneficiate” – nobody’s talking about that. Even when they are talking about it, nobody says: “Oh, by the way, let us be part of it” – so that you don’t have a partnership that is helpful, that you feel that these people are taking you differently. So, these are some of the examples that we talk about. In some countries, it is worse. There are countries who were former colonial countries, who still try to manipulate the financial flows to their former colonies – it’s not right. They are using their possibilities to manipulate people who must be helped to stand on their own. We want the alternative. There must be an alternative, I must have a choice. SS: Okay, so with the alternative comes the big question, President Zuma – why trust China? Why should trust China? You’re not quite on an equal footing with a country like China. JZ: China has never been a colonial country. SS: That’s why you should trust China? JZ: Their attitude is formed not by a superior kind of feeling. Their attitude is formed by the fact that they themselves suffered, but also they’ve been with us in this struggle, they’ve supported our struggles. The Western countries did not support our struggles, they didn’t, even when we were asking. We had to make do in order to be able to liberate ourselves. China comes to us as partners, not as former bosses or whatever, and we can therefore have a discussion that is totally different. SS: So what makes China so interested in South Africa? JZ: No, not in South Africa only, in Africa in general. China is interested in whole Africa, and they are very keen to see us developing. You know, when there was a colonial period, if you looked at the African map, the roads, rails began where the mines were - to the harbors. Nothing more. But since China started working in Africa, their highways, they have build them in a number of countries. There has been development. That relationship must tell you that China looks at Africa, even if it is doing business - but at least they’ve got a view that lets us help African countries to develop, let us have roads and other things. JZ: Absolutely. They are economy #2. SS: Yeah, so aren’t fears of Chinese dominance in BRICS bloc real, no? JZ: We discuss with them differently. That’s why I’m saying it is not the same. You know, the OAU was established in 1963. There was no help to help even build the venue – and China has built the venue of the OAU HQ. That tells you the difference in terms of how they relate to us, and how the Western countries have been relating to us historically – I’m not saying we’re therefore enemies, we are not. All I’m saying – we do business today, we can make a choice. In the past we couldn’t make any choice, today we can make a choice. SS: President Putin has actually proposed creating sort of credit rating network that would counter-balance the existing credit reports that are issued by Western credit companies like Standard & Poor, or Moody’s– is this something that South Africa would be interested in? JZ: Absolutely, because you don’t know what is it in fact that people look at – because they are not part of it any way, but also we need people who can look at these things with an understanding that is more balance, so to speak. They could understand some of the causes of some difficulties. I think it’s not necessarily to say that they must not be there, but you need other people to look at things differently, because generally, as I say, whether you are in Europe or in the United States, they have a particular look on Africa, we have a particular look on them - now we need some balance, somehow. At times, the reasons why they downgrade or not downgrade – we don’t agree, at times, with the reasons. SS: Do you think they are unfairly reporting? JZ: At times. At times they are. At times, they just get influenced by the media, you know, how the media reports. We want something that is very objective, that is very scientific and realistic. We are not saying that they are not – but we are saying, “at times”. When we tried to find out what is it, we realized that at times… for example, whether the economy is growing or not, if there’s a big strike or a protest – they already have a view, and on the basis of their view, they take a decision. They don’t even look at how you solve the problem. So, in my view, you do need different approaches to look at these matters, so that you could have… some people will look at it differently, and perhaps arrive at slightly different conclusions. This is healthy, it will be healthy if that was happening. I mean, the very fact that we’ve got so many of these institutions, not one, and many of them react differently, not at the same time – so we need more of that, particularly with people who come from different background. SS: President, thank you so much for this interview. We wish you all the luck in your future endeavors. JZ: Thank you very much.